StarCraft's top designer called last month's stir over a "World of Starcraft" mod "a big misunderstanding," but said the mod's creator could be seeing job offers down the road, possibly from StarCraft's studio itself. Dustin Browder, the game design director for StarCraft II, told Eurogamer that his shop wants to shake Ryan Winzen's hand "and say sorry for the misunderstanding," when the St. Louis-area modder visits Blizzard Entertainment, on an invitation from the publisher. Browder and his colleagues had been concerned that Winzen was building something outside of the official toolkit Blizzard released to the modding community. That wasn't the case. "You got to give him a break. 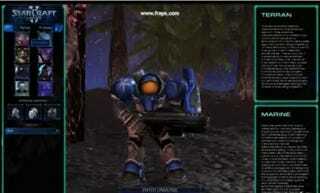 It's very difficult to look at that mod and understand that's a StarCraft mod," he told Eurogamer. The publicity over World of StarCraft - since renamed "StarCraft Universe" - brought an invitation from Riot Games to apply for a gig there, in addition to the expenses-paid visit to meet Blizzard. Browder, speaking hypothetically, said what Winzen's shown so far is nice, but his studio would need to be assured of Winzen's talents and other work methods before offering him a job. "If he's somebody who did all this great work and he passes all the other challenges to being a game designer, then yeah, he could be looking at offers from me or from other developers around the business," Browder said. "A YouTube video of something technically impressive is not a game designer, but it is on your way. It is possibly a game a designer, which is very exciting."